Every modeler must be familiar with the situation where you find out too late that there is some serious error in the kit you just finished (at least that's what I keep telling myself ). I decided to put some examples online just to try and help fellow modelers not to repeat my mistakes. 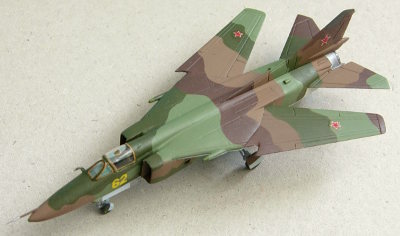 For now there's just the MiG-27 and a warning without pictures. Decent Flogger kits are hard to find. 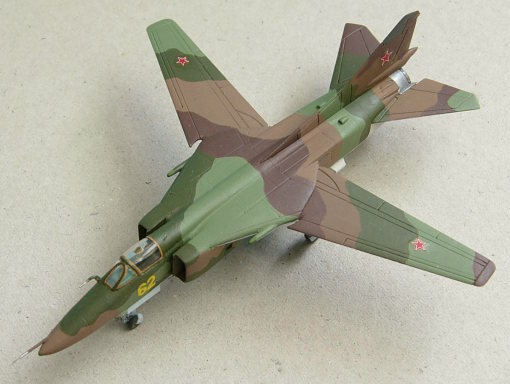 There's plenty of kits available (Crown, Minicraft, Revell, Hobbycraft, DML/Italeri and recently Airfix) but most are missing the looks of the real thing by a (scale) mile. The DML kits however look quite good, so I decided to do it more or less straight from the box and leave the wings movable. During construction, I noticed the main wheel doors had a simplified arrangement compared to the original so I corrected this. 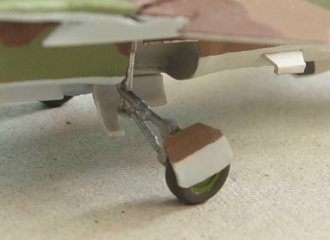 The wings would be hard to paint when fitted to the fuselage and the pivot points were not exactly in the right location. On a real Flogger, the pivot point is clearly visible on the lower wing root surface. I decided to cut away the pivot points in the kit, drill a hole at the proper location through the lower wing root and use a tapered piece of stretched sprue as a new pivot for each wing. This would allow me to fit the wings after painting and finishing the kit. All went well, I dressed up the cockpit (after removing the blob that DML uses to fill the interior), added pitot tubes of metal wire and trimmed down the outer parts of the main landing gear legs. Total area of the vertical fin is too small and the nose is 5.5mm too short. Apart from being too short, the nose also lacks depth, making the finished kit look a bit funny. This would have been fairly easy to correct during construction but with the fuselage assembled there was no way to correct the nose without wrecking the kit. Apart from these errors, I liked the kit so I finished and painted it and bought a new one for later. The undersurfaces are in pale blue (FS.25526) except for the rear fuselage section between the main wheel bay and the engine exhaust, which is finished in heat resistant gray (FS.36495). Dielectric panels are medium gray (FS.26132) and wheel bays are light gray (somewhere between FS.26373 and FS.26493). Note that all Fed.Std. numbers are nearest matches, if two numbers are mentioned these indicate the extremes in color variation observed, so there's a lot of variation in the colors. Reader beware: metal foil and super glue don't go well together ! One of the kits I have on my workbench is a Crown P-51D Mustang. As most late Mustangs flew with bare metal (even polished) fuselage panels, I decided to cover the fuselage of this little kit in bare metal foil. I cut out individual panels, rotating the foil by 90 degrees on adjacent panels to give a more realistic effect. After many hours of cutting and pasting, the fuselage was ready (that radiator intake was particularly hard to get free of wrinkles !) and it looked absolutely great. Then I noticed the filler in the forward seam between wing and fuselage had cracked, so I decided to use a few drops of super glue as an easy way to fill the crack. Fifteen minutes later, the entire coat of metal foil had turned white: the metal foil had attracted the blooming vapours of the curing glue !